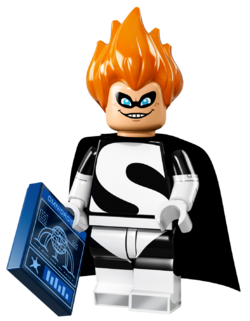 Syndrome is a Minifigures minifigure released in 2016. Syndrome is the main antagonist in the film The Incredibles. This is a description taken from LEGO.com. Please do not modify it. (visit this item's product page) Syndrome wasn’t born with any special powers, but he always envied the attention and admiration that super heroes received. Driven by jealousy, he used his intelligence and cunning to turn himself into a super villain. Now he spends his days at his remote island lair, inventing hi-tech gadgets and robots to carry out his diabolical plot for vengeance! Syndrome wasn’t born with any special powers, but he always envied the attention and admiration that super heroes received. Driven by jealousy, he used his intelligence and cunning to turn himself into a super villain. Now he spends his days at his remote island lair, inventing hi-tech gadgets and robots to carry out his diabolical plot for vengeance! This page was last edited on 13 July 2016, at 04:34.